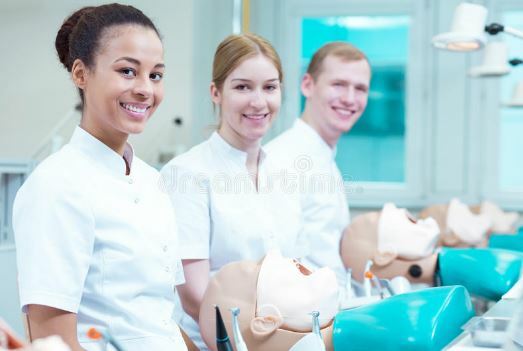 Dental degree in the countries like India, U.S., Canada and Australia have got separate branches for the Post-graduation after the Bachelor degree is completed as there are 9 recognized Dental specialties in these countries, and passing out in these post-graduation courses would give the professionals a special recognized name, for example, a Prosthodontist for someone who did a post-grad course in the Prosthodontics course after the Bachelor degree. Oral Medicine and Radiology – A branch of Dentistry that deals with the diagnosis, treatment planning and the radiology of the Dental diseases and conditions. Oral and Maxillofacial Surgery – A branch of Dentistry that deals with the major and minor surgical procedures, including the extraction of teeth, surgical removal of cysts, tumors, correction of fractured jaws and transalveolar extraction of teeth. It also includes the Dental anesthesia administration. Pedodontics & Pediatric Dentistry – A branch of Dentistry that deals with the Dental diagnosis and treatment in the Children and Adolescents. Periodontics – A branch of Dentistry dealing with the diagnosis and treatment planning of the problems and conditions that occur in the Periodontium, gums and the structures around the tooth. Conservative Dentistry & Endodontics – A branch of Dentistry that deals in the internal structure of the tooth, and diagnosis and treatment planning of the problems in the Pulp and the other parts of the tooth, and the periapical areas. Orthodontics & Dentofacial Orthopedics – The branch of Dentistry that deals with the correction of the Malocclusion, different approaches to treat the conditions like irregular teeth, problems in teeth arrangement and the jaw correction. Prosthodontics – A branch of Dentistry that deals with the replacement of missing teeth, in either a removable of fixed aspect and replacing it with or without the support of the jaw and soft tissues. Community Dentistry – The branch of Dentistry that deals with the Dental health status of the entire community, a particular locality to assess the dental awareness and to understand about the Epidemic and Endemic diseases in the localities. Oral Pathology & Microbiology – This branch deals with the studying and understanding the histological and radiological features of the Dental diseases and conditions and the Microbiological factors for each of it. There are slight changes in the specialization branches of Dentistry in the U.S. and Australia, but most of the branches are the same as they are in India. Dentists from other countries who want to practice Dentistry in countries like USA need to clear NBDE Part 1 and 2 and complete DDS course for being recognized as a Dentist.